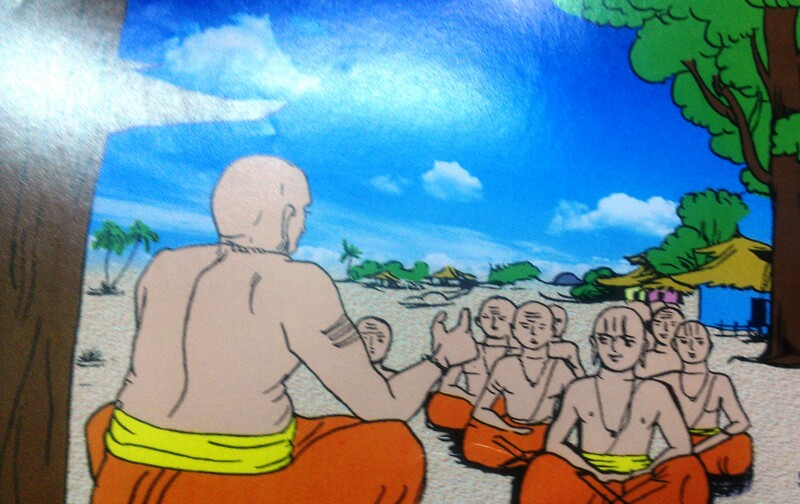 Yadavaprakasha one of the great vedantee of Kancheepuram was childhood Guru for Swami Ramanuja . 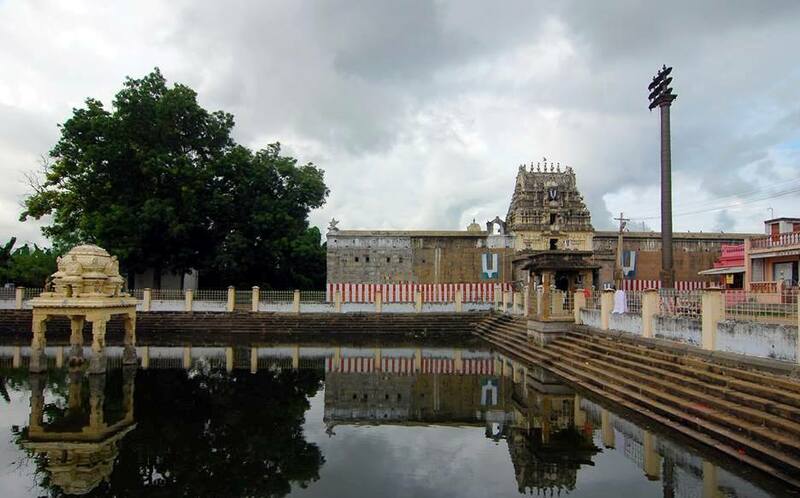 LORD VARADAR rescued Swamy Ramanuja in reaching Kancheepuram safely . 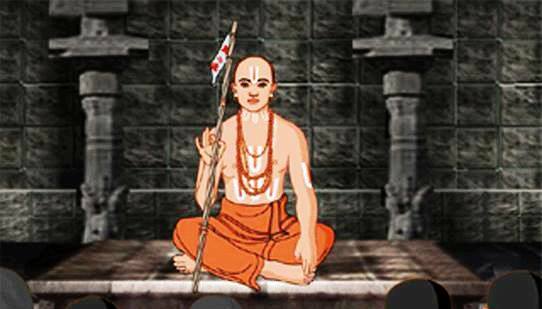 Swamy Ramanuja serving the Lordships attracted many disciples for his philosophical thoughts and beliefs Swamy Ramanujas objective was to reconcile the Vedas, the Upanishads and the Gita with the Tamil Divya Prabandha. This new school of thought attracted many of them . Yadavaprakasha was upset with the turn of events . 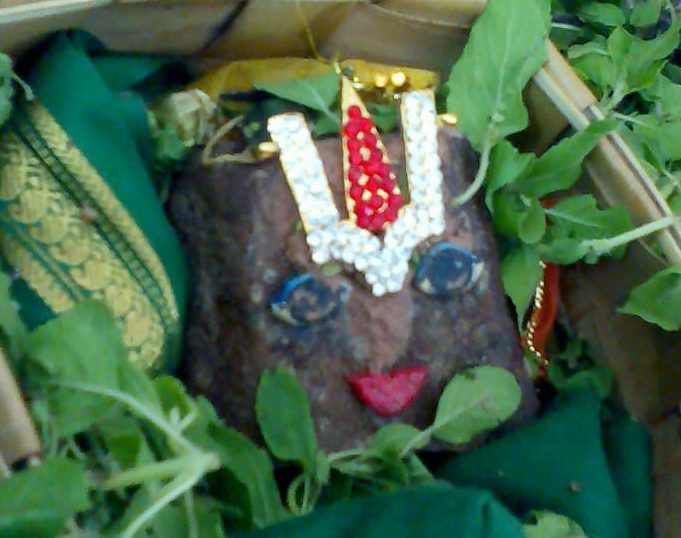 Once it so happened Yadava Prakasa’s mother came to have darshan of Lord Varadaraja. 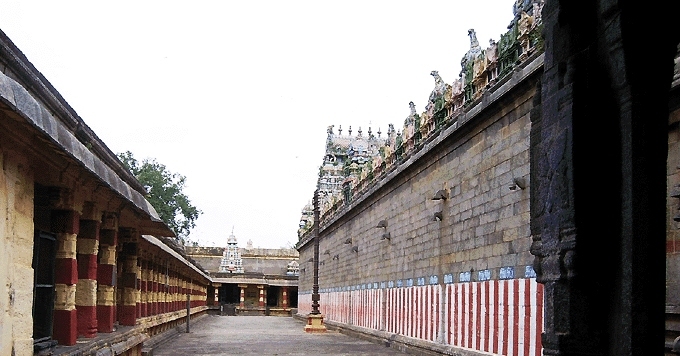 She saw Swamy Ramanuja coming along his disciples inside the huge temple . Impressed with his divine thejas she offered obeisance’s instantly . She strongly wanted her son to take shelter of Swami Ramanuja and be of some use to the great personality .Praying Lord profusely she marched home to advise her son . She told her frank opinion of Swamy Ramanuja’s greatness and wanted him to become his disciple for his own up liftment . 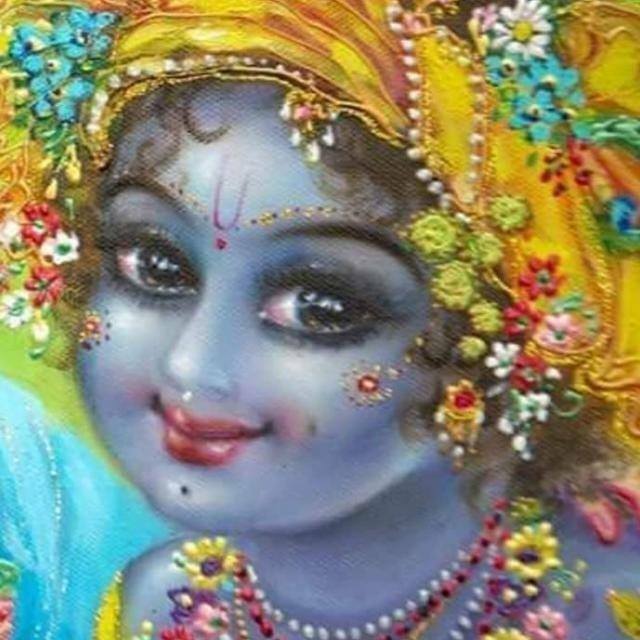 Yadava Prakasa bluntly refused and told his mother that it was not possible for him to become disciple of his very own disciple who was much younger to him in all ways . He felt it was below his dignity to accept him as is guru as swamy Ramanuja himself was his disciple for a long time. Though he refused his mother’s suggestion initially , Yadava Prakasa became restless . He was forced to recollect the incidents how Ramanuja used to contradict him when his definitions were wrong to some of the scriptures. ( Many occasions arose when the he used to clash with Swamy Ramanuja on vedantic statements. Swamy Ramanuja used to fearlessly point out the errors and corrected him. The ego in him was slowly shying away . He also remembered that only Swamy Ramanuja was successful in curing the princess and driving away the evil spirit. His heart agreed to his mothers advise . But the mind was rigid . He was in a dilemma and was not sure what to do. He rushed to meet the great devotee Swamy Thirukachi Nambikal and solicited his advice. Thirukachi Nambikal advised him to to accept Swamy Ramanuja as his guru for he would progress spiritually to higher levels very soon . The tussel between his mind and heart went on . Yet Yadava Prakasa was not convinced. That night he had a dream in which a saint appeared and told him to follow the advice of Thirukachi Nambikal for his own good. Next morning Yadava Prakasa decided to listen to his heart . He went to the mutt where Swamy Ramanuja was staying. Swamy was very much pleased to see his guru and offered him a seat with great reverence. Observing the kashaya robes , the Urdhvapundram on his forehead , the shanku charka mudras on his shoulders swamy Ramanuja was glowing with divine thejas . Yadava Prakasa’s ego got shattered and he looked at Ramanuja with total surrender and admiration. Yet his mind wanted to clarify some of his doubts. He asked Swamy Ramanuja whether there was any convincing evidence in sastras for wearing the Urdhvapundram and for initiating the insignia of sanku chakram at the shoulders. Swamy Ramanuja turned to Kurathazhvar one of his disciple and advised him to answer Yadava Prakasa’s question. Kurathazhvar replied to Yadava Prakasa, “ Sama veda is supposed to be the best of the Chatur Vedas. Even Lord Krishna announces that among Vedas he is Samaveda! It is depicted in Sama Veda that Brahmins should initiate Thirushanku and Thiruchakram on the shoulders other than wearing sacred thread. They would attain Brahma lok through the blessings of Brahma. Swamy further elucidates the importance of the scriptures in the subject Kurathazhvar explanations makes Yadava Prakasa spell bound. Instantly he submits to the revered saint apologising for his foolish acts . He falls at the lotus feet of Swamy Ramanuja and pleads him to forgive him for all the sins he had committed. He pleads him to accept him as his disciple and uplift him the right path. Swamy Ramanuja with abundant compassion gives a warm hug and with affection initiates him to Sanyasa ashram after performing the Pancha samskaras . He rechristens his name as Govinda Jeeyar . Swamy Ramanuja advises him to write a book on the subject , “The duty of sanyasis.” Becoming his disciple and following the guidelines of Swamy Ramanuja Govinda Jeeyar at the age of eighty Yadava submitted a book “ Yathi Dharma Samuchayam,” and dedicated it at the feet of Swamy Ramanuja. It was really a cherish able event as a Guru became a disciple ..
Handling and proficiency of foreign language is amazing. Adiyean welcome many more postings like this. Adiyean is feeling surprised about the pictures . Mostly fitting pictures are creating hitting effects in mind and heart. Prajna + Gynam = Supreme emotional intelligence. Gynam is story and Prajna is the effect. Both are highly divine and addictive. Dasaanudasannku dasan, Swamy ramujar in thiruvadigale sharanam. Please write the history of all Azwargal for the good of the world. even bringing one good thought to any brahmana is worth the effort and cause of brahim hood. Excellent information on Sri Rama nu jar and other always which keeps me brushing my memory. Adeyen Dasan.